French-Canadian cartoonist Julie Doucet hasn’t made comics-proper in nine years, but she remains an important influence in the field. Without Dirty Plotte, her autobiographical series published by Drawn & Quarterly in the ‘90s, we probably wouldn’t have Lisa Hanawalt, who has a lighter touch but a similar desire to push boundaries while investigating femininity. 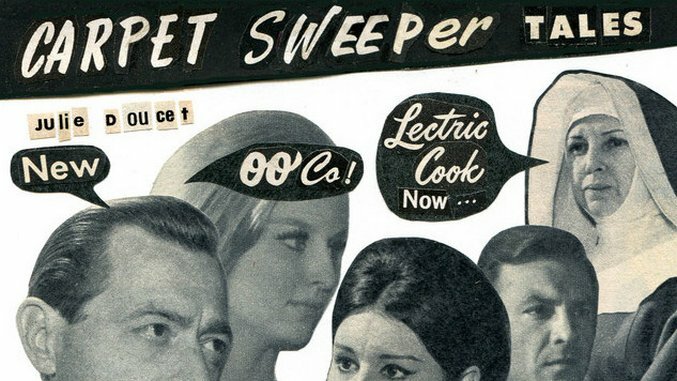 Carpet Sweeper Tales, Doucet’s new book, isn’t exactly comics. Except it probably is. Consisting of short narratives made from photo collage—using Italian photo-novels for the visuals, and speech balloons clipped from vintage magazines—it’s not “drawn” in any traditional sense. But the Italian word “fumetti,” which means “photo-novels,” also means “comics.” Furthermore, if collage isn’t comics, then what about David Rees? What about frickin’ Jack Kirby? This stuff is sequential art that happens to be appropriation art at the same time. That doesn’t make it “not comics,” and D + Q’s use of Ben-Day dots for the pattern printed on the inside of the paperback cover is a big, old wink-wink in that direction. The real question is whether Carpet Sweeper Tales is readable or if it’s too arty for its own good. That answer probably depends on you and your level of patience. Doucet says she wants you to read all the dialogue out loud, but it doesn’t necessarily make any more sense when annunciated. Characters have exchanges like, “Because Be Ba naly ap hoa wa Wo CA Coo spinc ra ori coa BE ney” and “bo?” Some of them utter things that aren’t even words, but merely looping designs. And yet it’s not utter nonsense either. It’s a bit like watching a Danish movie with the subtitles off: you can grasp about 15 percent of what the characters are saying, through the close relationship of their language to our own. Much of the import is in the way they look at one another, mostly while trapped behind the wheels of their automobiles. There’s a lot of Douglas Sirk-esque longing and a desire for the fast and the new, so Doucet’s use of typefaces from the late 1940s to about 1970—mostly taken from advertisements—is apt. In some ways, Carpet Sweeper Tales is oddly consistent with the author’s earlier work: women are trapped, lusted after, beaten, run over, hooted at and generally given zero agency. Men repress their homosexual desires by confining their talk to objectifying women. It’s not exactly a novel take on the era, but it’s also not untrue. The result is interesting, if often baffling. Not only is the content often confusing, but you don’t understand if you should understand. Whether or not you enjoy that is probably up to your own tolerance for artists who play games, but there’s no doubt that it’s interesting.